Like wine a whale watching year can be good or simply outstanding. 2013 was an outstanding year in terms of breadth of species and the consistency of sightings. It was no coincidence that we also had an excellent summer with lots of sunshine and calm sea conditions! The weather in April and early May though did not bode well for the forthcoming season as we had some very cold easterly winds which caused a temperature inversion where the surface waters were colder than the deeper waters. 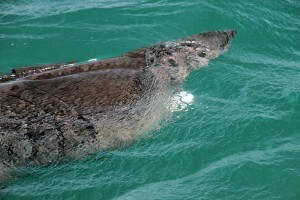 This had an impact on basking shark sightings. We think it stopped the phytoplankton from rising to the surface waters as it encountered a thermocline around two metres down. We saw plenty of “baskers” just under the water surface in all the old haunts but not so many at the surface feeding, mouths agape. Traditionally, although the basking sharks may be present for many months feeding below the surface, we don’t see them until the warm sunny weather draws the phytoplankton up in the water column. Then these enormous animals, the second largest fish in the world, follow this food source and we see the tell tale dorsal and tail fins breaking the surface. With the younger animals we also see the bulbous, rather porcine snout. Unusually this year we saw a disproportionate number of quite young basking sharks. One of the unusual occurrences of 2013 was the reduction in the number of porpoise sightings. We run a continuous porpoise survey every year in Roaringwater Bay and east to The Stag Rocks. Monthly numbers recorded from April through to December were well down on previous years causing us some concern initially. Strangely enough, my colleague Duncan Jones in Penzance recorded higher numbers for 2013 than in previous years. We are looking to try and link our data and surveys as this is quite likely to be related to the availability of suitable food. It may also support our long held belief that these diminutive cetaceans are not restricted to coastal waters and that they may well travel large distances over open ocean to more productive feeding grounds. The stars of 2013 however, were the minke whales. Even in the very cold April and May we were seeing young animals throughout inshore waters off Baltimore but in late June warmer conditions prevailed and the water temperature rose 5 degrees within a few weeks. The resulting plankton blooms provided a ready food source for sprats and other small shoaling fish and we saw large aggregations of these different fish species throughout West Cork’s inshore waters. Unsurprisingly the minke whale numbers from Galley Head to the Mizen Peninsular burgeoned and the resultant sightings were little short of stunning. Helped by the consistently good weather last year we had some unique encounters with this lovely little baleen whale from June all the way through to October. After October numbers start to decline throughout West Cork’s inshore waters as they move offshore and we assume further south. Little is known about the movements of the northern hemisphere minke whale (Balaenoptera acutorostrata) during the winter months. Some have suggested they may travel over the equator to the southern hemisphere but as yet this has not been demonstrated conclusively. Current thinking is that northern hemisphere populations of baleen whales remain north of the equator for the whole year making less dramatic seasonal migrations than some of their southern counterparts. Another cetacean species that quite simply “blew us all away” during 2013 was the short beaked common dolphin. Traditionally these charismatic little cetaceans move inshore to feed during the second half of July affording us stunning encounters with groups of adults, adolescents and calves well into December. 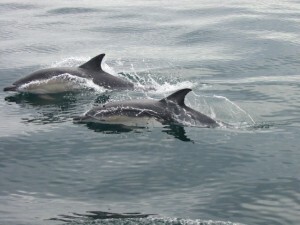 We broke our own record of short beaked common dolphin sightings last season. From 21st July through until the 29th September we had an almost unbroken record of daily encounters. Between those dates we had nine days when we failed to encounter dolphins and for seven of those days we were unable to get out on the water due to weather anyway! A better than 90% sighting record much to the delight of our many customers from all over the world. 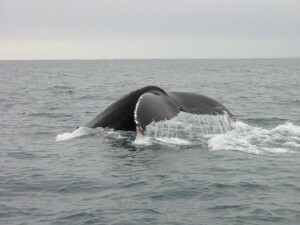 One of the highlights of late August was an early encounter with two travelling humpbacks. This is quite early for sightings of this species off West Cork. 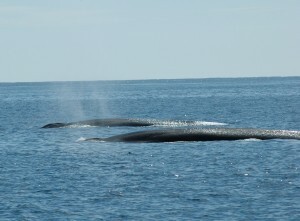 Heading west from The Kedges, where we picked them up, we had some lovely views of these large baleen whales blowing and tail lobbing as they traversed Baltimore Bay towards the Gascanane Sound and on towards the tip off Cape Clear Island and points west. Later in November and into December this same species treated us to some lovely lunge feeding activity across Baltimore Bay culminating in fabulous breaching activity captured so skilfully by Robbie Murphy of Sherkin Island whose lovely images were published in the national broadsheets yet again confirming Baltimore as the premier whale watching destination of Ireland. 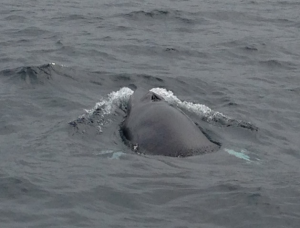 During the first week of September we encountered a lone fin whale south of Cape Clear Island followed a few days later by reports from fishing boats heading into Baltimore of groups of fin whales feeding south of Baltimore Harbour. We enjoyed a week of lovely encounters as these animals continued to feed as far south as The Fastnet Rock and Lighthouse and on one occasion heading right into the Gascanane Sound between Sherkin and Cape Clear islands before heading southeast. We continued to see fin whale activity throughout November and December off Baltimore, Cape Clear Island, Sherkin Island and The Kedges and into Barlogue Bay. 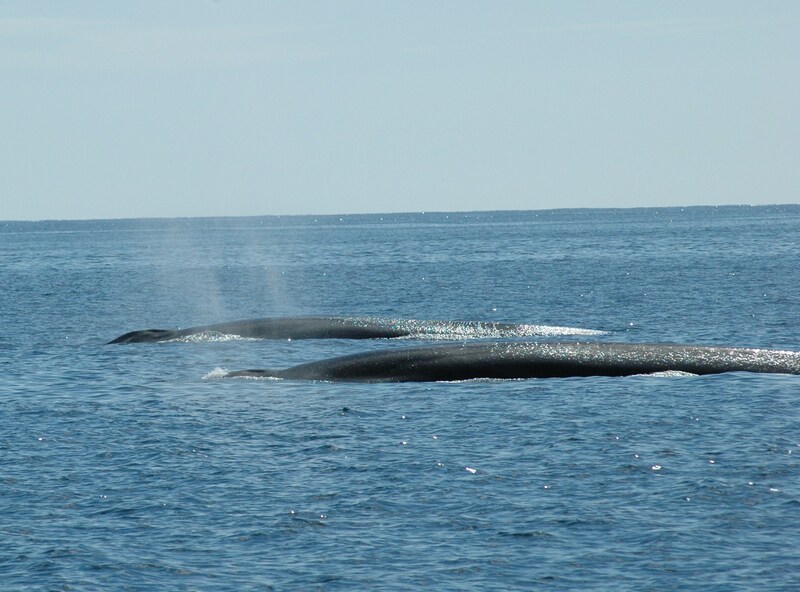 Some of the best images of West Cork’s fin whales I have seen were captured by the very talented Deirdre Fitzgerald aboard Voyager, showing some lovely lunge feeding activity, which she so generously shared with other customers and over 2000 followers on our Whale Watch West Cork Facebook page. 2013 was certainly a year of highlights. We had the largest Atlantic sunfish I have ever recorded off West Cork, easily two metres long and a metre high. A lone Risso’s dolphin and calf. Many juvenile minke whales and one very new minke calf that came and inspected our stationary boat – judging by it’s size we estimated it to be no more than two weeks old. 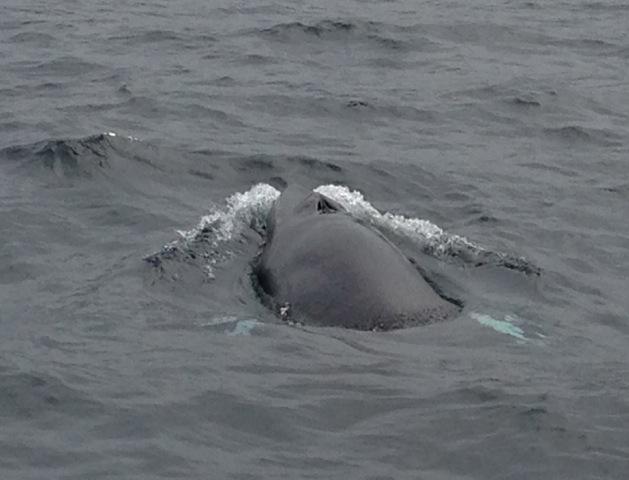 Minke whales swimming under the boat on several occasions. A minke whale that breached over 17 times in front of the boat as we headed slowly up the south coast of Sherkin Island to the Gascanane Sound. 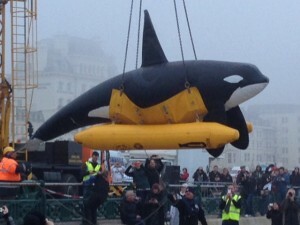 This same animal later breached within 20 feet of Voyager’s stern as we drifted on the tide. No season is complete without a turtle sighting. On several occasions through the summer we encountered large leatherback turtles heading west across Baltimore Bay. Pelagic bird species continue to thrill the birders amongst us. Skuas, petrels, razorbils, puffins, guillemots and shearwaters consistently being seen. During 2013 we had large numbers of Corey’s shearwaters feeding inshore among the groups of Manx shearwater forming some of the largest rafts of mixed shearwater species we have ever encountered off West Cork. 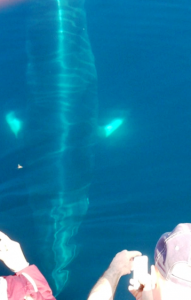 >>> Weekend, residential whale identification and watching courses. 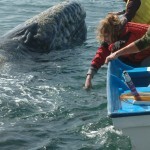 We are ideally situated in Baltimore to run these exciting whale watching events for the cetacean enthusiast. We plan these popular courses from July to November. Dates will be published very shortly. 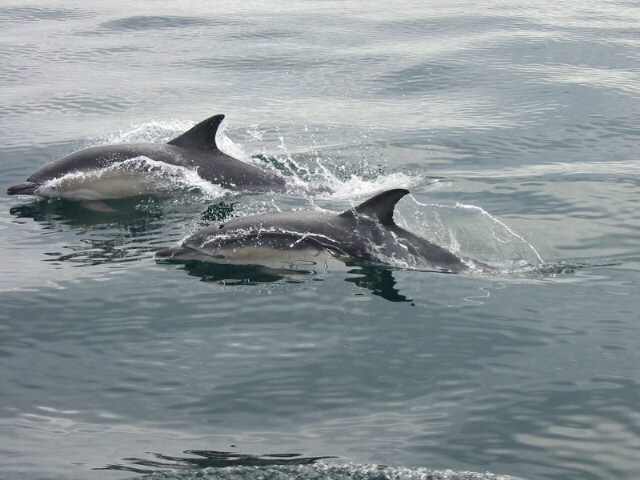 >>> By popular demand we will be running boat based and terrestrial walking tours to view other species of Ireland’s Marine and Estuarine wildlife. Details to be published shortly. >>> Once the larger species have departed from the Baltimore Bay area and started to move east following the herring we will be continuing with our “Cork Whale Watching with Nic Slocum” programme through the winter months off East Cork. Other initiatives designed to address some of the pressing issues related to Irish Whale and Dolphin Conservation will be announced as they are developed this year including expansion of the schools programme. For the second year running we will run our popular wildlife weekend in conjunction with Sea Shepherd Ireland July 11th, 12th and 13th. This action packed weekend will include island nature walks on Cape Clear Island and boat based whale watching courses as part of the programme. A must for anyone interested in supporting Sea Shepherd Ireland and the important direct conservation work that Sea Shepherd get involved in, both here in Ireland and overseas. Whale Watch West Cork will be running tours all that weekend in support of this Sea Shepherd initiative. There will be a whale identification course running in conjunction with this weekend. During the summer we will see the return of Sarah Hucek, our outstanding assistant guide and crew aboard Voyager. Sarah, who is Austrian, proved an invaluable asset to us on board Voyager last year as she manages all our German customers. Her warm and friendly nature makes our customers feel at ease immediately they step on board. In November 2013 Whale Watch West Cork attended the International Whale Conference in Gloucester, Massachusetts as part of the team from the Responsible Whale Watching Partnership (RWWP) of Whale Watch International. Whale Watch West Cork achieved second place in the prestigious Responsible Whale Watch Awards competing against whale watch operations as far apart as Iceland, Australia, Panama and the USA. Nic has been the chairman of the steering committee of the RWWP this past year and attended the International Whaling Commission Working Group for Whale Watching in Brisbane, Australia in May 2013 at the invitation of the IWC and NOAA. 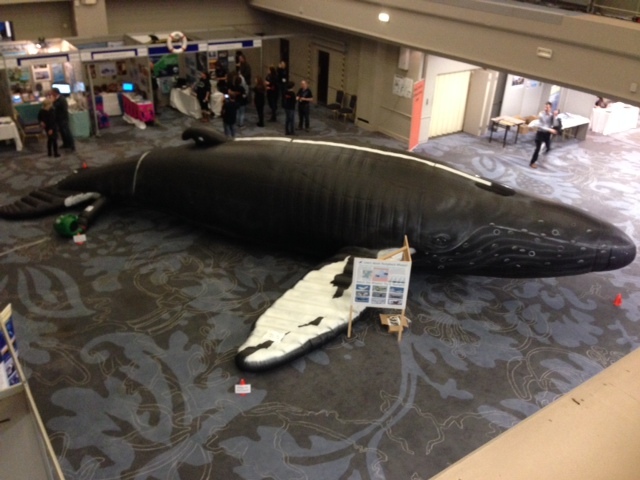 This busy year of meetings culminated in March 2014 with Whale Watch West Cork exhibiting at WhaleFest, the largest whale festival of its kind in the world based in Brighton, UK. It was good to catch up and compare notes with some old friends from Whale Watching Panama, Futurismo from the Azores, Tumares from Spain, Cape Ann Whale Watch from Gloucester, Massachusetts, ROW Adventures from Vancouver Island and Marine Discovery Penzance from the UK among many others. We all attended the symbolic release of Morgan, a wild caught killer whale now languishing in abysmal conditions in the horrible amusement park Loro Parque in Tenerife. The documentary film “Blackfish”, released in the last year highlights the plight of killer whales and other cetaceans kept in captivity but especially that of Tilikum, the bull killer whale involved in the death of trainer Dawn Brancheau in February 2010 at SeaWorld, Orlando, Florida. Try to see this film if you have not already. Our overseas tours to see iconic species in difficult to get to locations continue to be very popular. We run these overseas tours through our sister company Whales Worldwide and our tours during early 2014 to Mexico and Maui were outstanding. 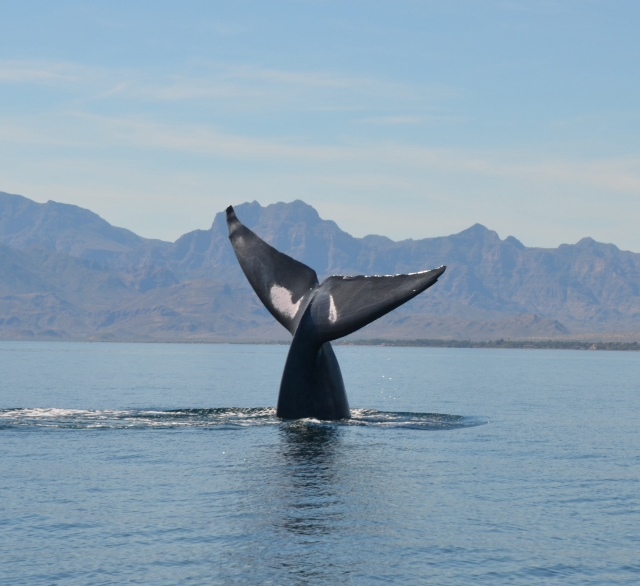 The blue whale activity throughout the Loreto Marine Reserve this year was incredible with humpbacks and fin whales also being seen among the islands of the reserve. The humpback activity in the Moloka’i Channel between Maui and Lanai Islands was equally stunning with some amazing breaching and male heat run activity taking place. Mother calf pairs, some with newborns and others with boisterous “teenagers” continue to enthral our customers who come with us on these overseas whale watching adventures. We are busy promoting and filling the 2015 Mexico and Maui tours as we speak with a number of other tours being scheduled. 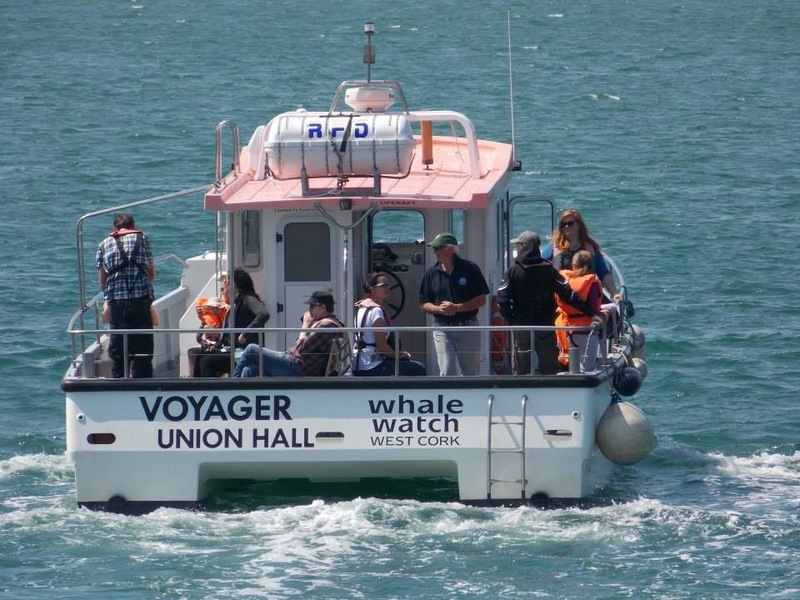 We will be launching Voyager after the winter layoff during the weekend of 5th/6th April and are really looking forward to the 2014 season of whale and dolphin watching off Baltimore – the Whale Watching Capital of Ireland.